Even though it's a small 50-acre park near the City of Orlando, Mead Gardens is one of my favorite places in Florida for birding. I've found many "lifers" here, and every time I go, I'm always glad that I came. On my first visit in May 2010, I stepped out of the car and immediately found a Barred Owl perched above the map display in the parking lot. And it's not uncommon to see one of these lovely creatures when I visit the park. Barred Owls mate for life and often maintain the same nesting sites year after year, and their territories cover at least 200 acres. So it's likely that the owls I see there are from the same family group year after year. They have few predators once they're grown; the most significant predator of Barred Owls is the Great Horned Owl. In fact, Barred Owls will avoid portions of their territory inhabited by Great Horned Owls. But owlets are much more vulnerable. They face many dangers, not least of which is the possibility of falling from a nest. At Mead Gardens this past Saturday, I came across a Barred Owl chick on the ground under a tree. This seemed odd to me, since he was in a high-traffic area of the park. Picnic tables were very near by, and it's an area where people frequently walk their dogs, and it wasn't moving. It then became clear to me that the owl had been severely injured, as if it had fallen from its nest. 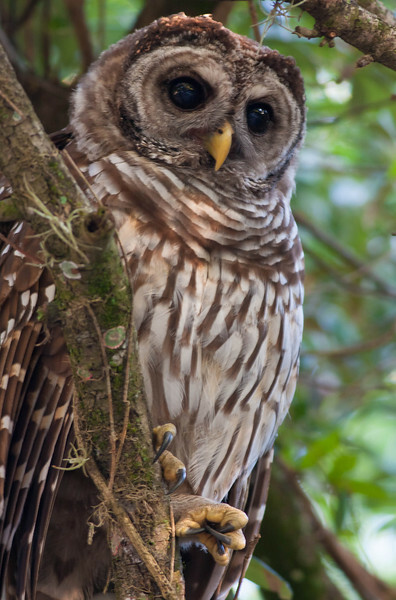 Barred Owls nest in tree cavities, often in nests left by hawks, crows, or squirrels. At about one month after hatching, the owlets begin to "branch"--that is, they climb out of their nest to test their wings to prepare for flight. This owl was about 5 weeks old, so it's likely that that he was testing his wings when he fell to the ground. Another birder I had met that day called the Audubon Center for Birds of Prey, and they gave us instructions on how to bring the injured owlet to the center, so we carefully collected the bird to bring it in. Barred Owl parents typically care for their young for four months, and sure enough, one of the parents was nearby keeping watch, so we were a little concerned about taking the little owl away. My new friend watched the adult while I collected the owlet. Thankfully, the adult didn't swoop me. We took the owl to the Audubon Center for Birds of Prey, which is about 10 minutes away from the park. The nice people in the center allowed us to be there for the initial diagnosis. His eyes checked out okay, and the break to the wing was not too severe. But the bird had suffered spinal trauma, and that injury was life threatening. We were told that if they saw no response to treatment in 3 days, the owl probably wouldn't survive. He did have some pain response in his feet, which was a positive sign. But sadly, I called the center yesterday morning, and I was told that his injuries were just too severe, and the owl did not survive. It saddens me that this little guy didn't make it. Despite the spinal injury, I was hoping to see the bird released and then "visit" him occasionally at Mead Gardens. But I'm comforted that now it seems he has a sibling at Mead Gardens that is doing well. I had shared my experience on an email listserve on Saturday, and on Sunday another birder posted that he saw a healthy owlet in the same location. I returned on Monday evening and found him branching in a tree in the same area of the park. So the Barred Owl family will continue at Mead Gardens, and this little guy will likely grow up and live nearby. I hope to have the chance see the owl on occasion as he becomes an adult. Already he seems to be doing pretty well. And I must say, he's quite handsome. Raptors are dangerous, and they will defend themselves, even if young or injured. So call a rescue center before attempting to rescue the bird to learn the necessary precautions to take. Note the location where you found the injured raptor, and with baby raptors look around for siblings, parents and the nesting site. Use a box with holes for breathing, and if there's no box available, use a thick bag or blanket. Make sure the container is secure. You don't want the bird to escape its container when you're in your car. Do not give the bird food or water. Take the bird directly to a rescue/rehabilitation center. And on a related note, be careful not to approach an owl's nesting site. When the fledglings are out, stay far away and photograph them with a telephoto lens, and don't be afraid to crop your photos to get a "close up look." Birders and photographers that come too close to the nesting site may cause the parents to choose a different nesting site in the future. And if you live in Central Florida , you may also consider attending the Audubon Center's annual "Baby Owl Shower" coming up on May 12, 2012 from 10am to 2pm. They use this fundraiser to help feed and care for the raptors that are brought to the center. Thanks, Mary. I think this happens pretty often, from what I can tell. Such a beautiful post! Despite the tragedy I'm glad to know that there's a sibling who's alive and well. Your post reminded of an owlet that a friend had nursed for a while. It had fallen off a tree in her garden. Its injuries, I think, were not as severe as the owlet's in your post. Thank you for stopping by my blog. I had tried commenting here last week but couldn't. I'd love to be here again. Thanks for sharing this sad but hopeful story Scott. It is tragic that one of the young owls perished but very hopeful because one did survive. So true! Perhaps I should have titled it "tragedy and hope" for the family. Thanks for sharing this infom. We have a Great Horned Owl nesting at our school in a high traffic area with little room for the birds to branch out. One year the owlet fell to its death. This year we have two owlets in the nest. Good info to have on hand. Nice post Scott! I hesitated to read it, but I'm glad I did! Very sad that the one owlet died, but I'm glad you were able to help him & that you found out he has s sibling that's doing well! I've often wondered if this happens very often. It seems to be more often than we realize. Thank you for this post Scott. Albeit the tragedy, the post is very nice! The pictures are great and speak a 1000 words towards your story. The watchful parent almost looks sad :-( Mead Gardens is one of my favorite places as well. Thanks again for the updates. Feels connected to home even as I travel. Thanks for sharing the follow up of the owlet and the important information. I'm glad you found that it had a sibling. I'd sorry to hear that one owlet died. It was good that you had an opportunity to try to help, though...love the photos. Very good job and an instructive story, thanks for letting us take part of your encounter with the owl, despite the sad end. It's one thing to know about the high mortality rate in the bird world, but quite another to see it first hand. Thanks so much for this post and for the hopeful ending about the sibling. There are actually 2 babies left in the park!! And they just started flying from tree to tree a couple days ago! So you're saying there's another sibling there? Fantastic! I went there on Saturday and didn't see any owlets, only the parent standing guard, so I figured the one had fledged. But It's great to hear there's a second! I went back again today and the whole family seems to be gone. But yes, we've been watching the 2 babies and the parents from a distance every evening during feeding time! It's amazing! But it seems they have changed locations. There has been a group of young boys in the area a lot that may have scared the family off! I saw an adult there a few days ago, but haven't seen any of the owlets again. By the way, your pictures are really incredible! What a sad story, yet a hopeful one also as you and others tried to help the owlet and the sibling survived. thanks for all the good advice on how to treat an injured raptor and especially the note of caution about approaching nesting site and young birds. I totally agree with you about not disturbing them and would rather go without a photo than upset a bird!